The county boundary of Derbyshire and Staffordshire is indicated by a red pecked line. The boundary closely follows the River Dove. In the margins of the drawing several dots annotated with place names indicate observation stations. This is where the surveyor stood to take triangulation measurements. 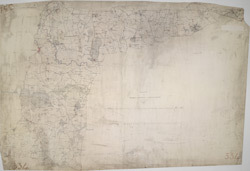 No indications of relief are given, suggesting that this is an outline plan, the midpoint between the original protraction and the finished drawing. The road network is precisely delineated. Major communication routes are coloured yellow, following military cartographic convention.